SAN FRANCISCO (AP) — Artemis Racing will continue with its challenge for the America’s Cup, although the Swedish-based syndicate will miss some early rounds of the trials as it continues to recover from the fatal capsize of its first boat in May. “We still have a mountain to climb, but our plan is to launch our new boat in early July and get ourselves in a position where we can race by the end of the month,” Artemis CEO Paul Cayard said in a statement June 7. British sailor Andrew “Bart” Simpson, a two-time Olympic medalist, was killed May 9 when Artemis’ 72-foot catamaran capsized on San Francisco Bay, trapping him under the wreckage of the 7-ton boat. Artemis crewmembers have since returned to the water, training aboard a 45-foot catamaran. The Louis Vuitton Cup for challengers is scheduled to begin July 7, with a race between the only other challengers: Emirates Team New Zealand and Italy’s Luna Rossa. Until Artemis is ready to compete, the number of days with actual races will be severely curtailed. The number of round-robins was reduced from seven to five, as part of numerous safety changes after Simpson’s death. Under the original schedule released long before the capsize, there were 21 races between July 7 and Aug. 4. If Artemis misses all five round-robins, there would be only five races between July 7 and Aug. 1. Organizers originally envisioned 12 challengers signing up for the series that will determine the opponent for America’s Cup champion Oracle Team USA, but only three have made it this far. Two weeks after Simpson’s death, regatta officials made several safety recommendations, including equipping sailors with body armor, hands-free breathing apparatus and high-visibility helmets. They also suggested a flexible start time for races, based on wind and projected tidal flows, wind limits and a safe buffer zone around course boundaries and obstructions. The team that is leading after the round-robins has the choice to advance straight to the Louis Vuitton Cup final, leaving the other two boats to contest the semifinals beginning Aug. 6. The Louis Vuitton Cup final will begin Aug. 17, with the winner advancing to face Oracle Team USA in the 34th America’s Cup, beginning Sept. 7. The 72-foot cats are the fastest, most extreme boats in the 162-year history of the America’s Cup. They have 131-foot mainsails that look and act like a jetliner’s wing, improving speed and stability. In a recent development, carbon-fiber hydrofoils lift the hulls out of the water and make the boats go even faster. SAN FRANCISCO — The America’s Cup Event Authority LLC is offering refunds to grandstand ticket holders, for races in the initial rounds of summer racing. 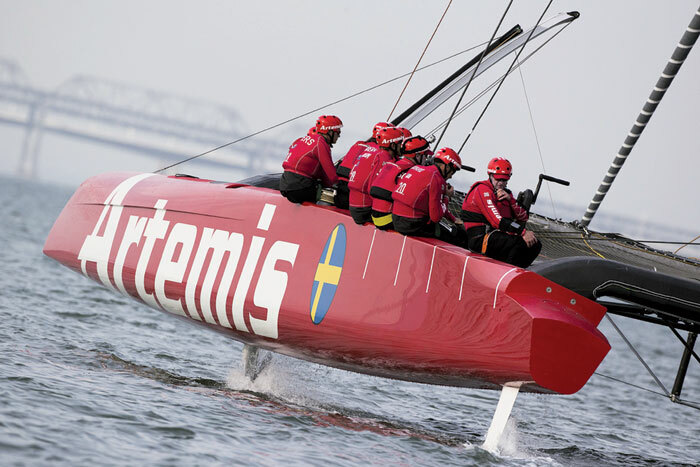 The decision follows confirmation by the Swedish challenger, Artemis Racing, of its intention to race in the Louis Vuitton Cup, America’s Cup Challenger Series, once it is satisfied its second boat is ready for racing. “This is the right thing to do for our fans who may be affected in the early rounds, before the racing hits full stride,” said America’s Cup CEO Stephen Barclay. Last week, Artemis Racing CEO Paul Cayard described the challenge ahead for his team as a “mountain to climb” as it works through the steps to be in a position to race by the end of July, ahead of the Louis Vuitton Cup semifinals. Fans who purchased tickets for the initial races will be informed via email of the refund process. All tickets for racing in the initial rounds (July 5-Aug. 5) will be refunded. Tickets for the Louis Vuitton Cup semifinals will be refunded as well, with those currently holding tickets given priority access for rebooking, once Artemis Racing confirms its racing schedule.